This charming Highlands NC home for sale is a Riverwalk cottage close to town. The 3 bedroom, 3.5 bath home is situated on a lot overlooking one of the community ponds and waterfalls of Riverwalk. One of the highlights of living here is its location, walking distance from Downtown Highlands NC. 28 Hemlock Ridge is being offered fully furnished and ready to move into. The cottage has been beautifully designed with decor from Summer House. Inside the home you will be impressed by the floor-to-ceiling stone fireplace, a centerpiece of the main living area. The open floor plan includes hardwood flooring and a bright window lined great room which flow into the gourmet kitchen and dining room. The kitchen will not disappoint the avid gourmet, fit for any chef. The bedrooms in this Highlands Riverwalk home for sale are suites, each with its own bath. The main-level master suite boasts a sitting area and opens to the covered deck. Its spa-like bath has granite counter tops, Kohler fixtures, a soaking tub, and a separate shower. The upper level is where you will find the two guest suites, in addition to a sitting area that overlooks the great room. Schedule a private showing of this Highlands NC home for sale today! Contact our team at Berkshire Hathaway HomeServices Meadows Mountain Realty today to learn more about Highlands NC real estate as well as to schedule your private showing of 28 Hemlock Ridge. We welcome the opportunity to help you complete a successful property search. A lot goes into finding the right home. Having help makes the process easier. Our team works hard to help clients navigate listings to find the perfect home. 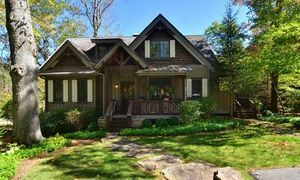 Let our knowledge and experience locate the ideal Highlands NC home for sale for you and your family.